We drove through the night to Port-de-Paix, crossing the Trois Rivieres and several locations, the 4-wheel-drive SUV slipping on loose boulders under water. When the tires started slipping away, and we couldn't go uphill, four of us had to jump out and push, the rocks flying about our ankles, and the acrid from burning tires in our nostrils. At one location a group of some seven people emerged from the blackness carrying furniture on their heads. 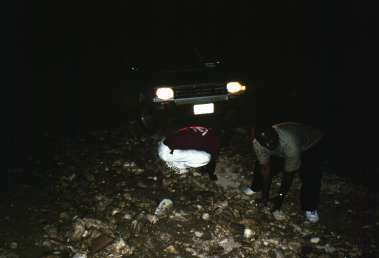 They immediately stopped and helped us push the 4-wheel-drive uphill, without which help we would have had to spend the night. The roads in the mountains consist of boulders from 4 inches in diameter to 2-3 feet in diameter. Fine particles have washed away from the boulders, leaving the roadbed an extremely bumpy surface. In the lowland areas, for example the salt flats near the coast, roads are made of the native clay, and they become mud sloughs in the wet season, cake hard in the dry season, the deep ruts frozen in. Realizing the severe condition of the roads to St. Mole to the west of us, the next morning we decided to reduce the number of stops during the next couple days. Before I had left for Haiti, I told family and friends not to expect me to return exactly the day of my return ticket. The reason, I realized, is that even a small mechanical breakdown could leave us stranded for a considerable period. As luck would have it, our mishap occurred on the way back to Port-au-Prince so I could board the airplane. After four days of punishing roads, our left rear wheel sheered off in a populated area, and the wheel rolled into a small shop that fixed vehicles! Four lug nuts had been stripped off the threads, and two of the wheel bolts were sheered off. This suggested that we may have been driving some distance with only four lugs. Mechanics who I saw working in Haiti took care of the the smallest motorcycle to the largest dump truck, usually with no more specialized tools than you would find in the trunk of the typical family car. Virtually all repairs are done in the street, and it is standard that you have to provide your own jack. 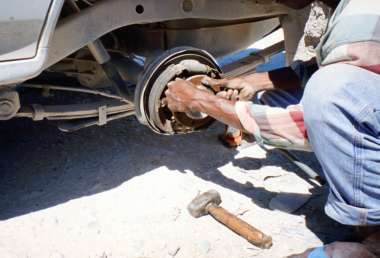 In our case a 1-inch edge of the brake drum had been chipped off, and after adjusting the various retaining strips and after a few skillful taps with a mallet, we were back on the road. Fortunately this little mechanic hut carried the replacement bolts needed for our 4-wheel-drive. Probably this is a common mishap to wheels.